File photo of the dome of the Basilica di San Pietro towering over the Vatican City. (Financial Times) - A stand-off between two titans of finance, the Bank of Italy and the Vatican, has forced tourists to abandon their visits to the Sistine Chapel - unless they have cash in their pockets. Italy's central bank has blocked all electronic payments through cash machines and by credit cards in Vatican City following the world's smallest state's failure to fully comply with international anti-money laundering rules. This is a sign from Tim the Destroyer of Worlds that money should be going to Ferretianism, the one true religion. Repent! At the end of the day, the RC Church is simply an 1800 yr extension of the declining Roman Empire. It was essentially set up by the Romans, the book used was largely edited and assembled under Roman oversight (with typical Roman consequences for trangressors which lingered on until the 19th Century). Below him are the Cardinals (Senators), then the army of bishops (Centurions) and footsoldiers whose prime purpose is the continuation of the Roman state in the guise of glorification of the diety. Rome alone decides how much tribute is to be collected, Rome alone dispenses what it decides is sufficient largess and all instruction to the entire RC Empire comes solely from the Vatican. It is NOT a democracy. So is it any wonder that "The Vatican" considers itself above many of the laws of this world? Noticeably absent: Chick-a-dee and Bill Deacon. I wonder why. They're ashamed. And rightly so. Now, now will Biden and Ryan will still want to go and kiss the Pope's ring over and over, time and again. Will Protestants like Huckabee and Robertson et al still want to go and subject themselves to the Pope, kneel before him like Jeb Bush did and kiss his ring over and over and over till they drop. Will the new breed of Neo-Christians neo-protestants still want to go and commit, submit and subject themselves under the Pope and kiss his ring over and over and over, again and again. I said this before and I'll say it again! The RCC is not a real church, much less the church of the New Testament. The RCC is a Politico-religious organization with several Financial and social interests all over the world. It is an Idolatrous organization and an Idolatrous religion. Idolatry is a grave and serious SIN. Idolatry IS NOT religion. Flee from Idolatry the Scriptures say. Then there is no true Church, since none of the protestant churches existed for 3/4 of the history of Christianity. They also disagree with the New Testament on such things as Communion (Jn. 6, I Cor. 11) or sola scriptura (the Bible nowhere says that it is the sole source of doctrine, thus sola scriptura is a contradiction). If you were a Catholic, you were likely not taught what the Church actually teaches, which is sadly far too common these days. Try examining Catholicism for yourself a little, you never know what you might find. The Vatican has been braking the law since ever since it was created! The difference is that religion has lost the power once had, and soon, as the bible states, they, as for all religions, will be brought down, in such a way that many will be in awe! Why? The bible states that its because religion has brought shame to Gods name, and a lot of innocent blood is in there hands! No hypocrisy among the deluded. Can't figure out how to defend the obvious criminal activities of the RCC, just amazing what you can accept in the name of your misguided faith, sad. Get yourself a sweet madona dressed in rhinestone sitting on a pedestal of abalone shell $25, or how about jesus on a stick made from sterling silver with semi-precious gem beads $80, and todays special a home bible and cathecism signed by the old Rat zinger himself, $125. The next tour starts in 15 minutes please purchase your tickets before hand. I think this might not be something new. Those machines didn't work when I toured through there years ago. It was like one of those ill-planned detours where most are turning around as soon as they pile in there. That the butler ended up in jail and the Rat zinger was never charged. 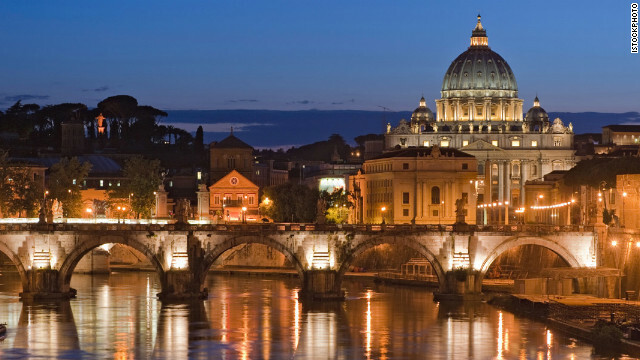 The Vatican has received a report on financial transperency, but it is secret. Of course it is. As George C said so brilliantly, god loves you and he needs MONEY. Religio-nutters, watch and listen. It is all about money and power. Where do you fit in, a deacon, between the as sociate and the soldier or are you higher up the pecking order? The Vatican has been breaking laws for years. I'm not surprised at this at all. The RC church fails to comply to laundering rules?!!!! Difficult to break two millennia of tradition. on Hobbit growth hormone is a Yeti. H0mo floresiensis (Flores Man) aka Hobbit. I'd make a pun about them being fattish in the stomach, shortish in the leg. A round, jovial face; ears only slightly pointed and 'elvish'; hair short and curling (brown). The feet from the ankles down, covered with brown hairy fur. ... but that would be misleading.